so i have this .62 smoothbore that i had commissioned jackie brown to build for me in the fall of 2016 that arrived at me in the winter of 2017. a simple farmer's gun, nothing at all fancy. i received it in-the-white and stained and clear coated the stock. since i had to pull the barrel to do the finishing work, i also pulled the breech plug out and sure enuf, it wasn't anti-seize lubed as i had asked for. looking inside was what appeared to be a burr from drilling and tapping for the flush liner (which i asked to be a chambers white lightning but was a knock-off instead). i used a stone bit on a dremel to smooth down that "burr" but didn't get it flush. the gun shot well, however, and is very pleasing to hold and shoot, with a very crisp trigger. running down a patched jag would always catch on that "burr". yesterday i decided to fix it once and for all, pulled the barrel and breech plug, and after careful examination i realized it wasn't a burr, it was the touch hole liner protruding into the chamber. a big no-no. i needed to pull the liner and file it down, but it's a flush liner with no slot and no hex key socket. i oil up the liner and attack it with an EZ-out ... the liner starts to move and ever so slightly raises up - good. then the EZ-out snaps off flush to the liner. cr@p. i really never liked or trusted EZ-outs and i just *knew* it was a mistake. spoke to my barrel smith in PA, bobby hoyt, and he said i've got real problem due to the hardness of that busted screw - which i knew, but was hoping bobby could throw me a hail mary pass that i could catch. we talked over several possible remedies but all were guesses. i decided to drill a pair of 3/32" holes on either side of the busted screw and drop in some cut 3/32" music wire and use the leverage of a clamped vise grips to wiggle the sucker out. didn't work. what next? i put a 1" carbide wheel in the dremel and ran it against the side of a grinding wheel that dropped its diameter to 3/8". i used the wheel to cut a slot between the edges of the holes i had drilled, wedged in a screwdriver and twisted counter-clockwise with a bit of downward pressure to keep the blade in the slot. it worked. free at last. amen. a few 1/4x28 touch hole liners on order. NOTICE how Horribly shallow the barrel threads are for the liner. this is a Huge safety mistake and glad i'm in the process of correcting it once and for all! new 1/4x28 liners arrived from TOTW ... wow, that was Fast! as expected, the liners were far too long, so i took a piece of 3/32" mild steel and d/t'd it for 1/4x28, then threaded in a liner, vised it and cut it down with a dremel carbide wheel. filed it up a tad and was surprised to see such a good fit on the first try. nikaled it in, then vised the barrel again and spun in the nikal'd breech plug. put the gun together and i think she's gonna be good to go ... at last. I sure am glad you take/post pics of your adventures! !! You sure work up some dooseys! Thanks for taking us along on your "fixes"!!! it ain't fixed by a longshot, just a bandaid job for now. i have a range date for today, leaving in 20 minutes. 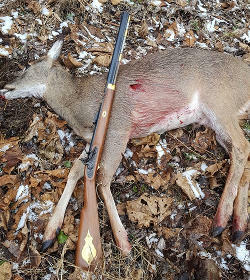 we shoot 400 and 700 yards with bpcr guns but sometimes we set up plates at 25 and 50 yards for muzzleloaders, and this smoothbore with get in some shooting today as well. i talked it all over with jim chambers last night. the game plan is to first drill and tap for a 5/16x32 WL liner and see how she goes. if need be, i'll open that up to 3/8x32 and file down any of the liner past the flat. at this point, i'll take function over form any day. i suspect i'll be happier with the 3/8 liner. since i've already troughed the breech plug, the touch hole itself lines up smack into the middle of the plug, as it should be. bottom plate on a fender telecaster guitar's bridge pickup - it's what i do. with the liners and d/t's having arrived a few days ago, this afternoon i had the time to forge ahead. locked the barrel in the drill press clamp, lined up the for the 5/16x32 liner bit and had at it. the resulting hole took out a lot of the original countersink. ... installing the vent liner - i can't get it in all the way, there's a whisker's space visible. there's a bit of the liner into the barrel. need to mark and file off or the breech plug would hit it when i screw it back in. For us EMR types, what is that gizmo in the next to last picture? that's the touch hole liner's grip top (locked in with vise grips). once the liner is homed in tight with nikal anti-seize lube i'll hacksaw that nub off and file the rest flush to the barrel.